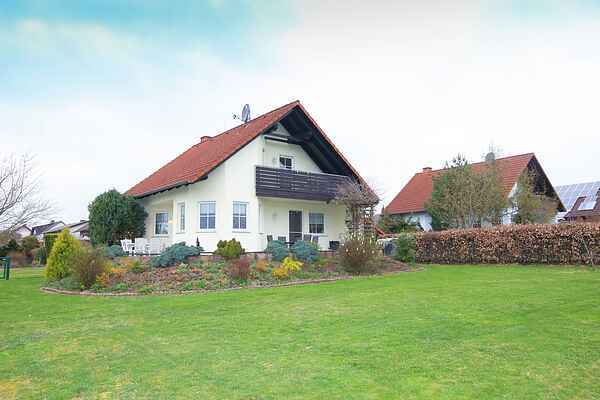 On the outskirts of the quiet Buchenberg, only 3 kilometers away from the beautiful Lake Eder is this beautiful detached house that you live alone. The balcony doors can be locked and the beds have adjustable slats. The house stands on a large enclosed grounds with views over the surrounding fields and woods. The Edersee is only 10 minutes walk, and run a variety of hiking trails right outside your door. Thanks to its cozy fireplace and the spaciousness of the house there is an all-season comfortable and central accommodation - the slopes of the Sauerland only have half an hour, and the famous cellar forest for the summer months is only 15 minutes by car. Briefly, a beautiful house in a beautiful environment.